Scott Gunderson, executive assistant at the state Department of Natural Resources, said a pollution case against an Oconomowoc waste hauler was better handled internally by the agency rather than by the Department of Justice. A top political appointee at the state Department of Natural Resources chose not to send a complaint against an Oconomowoc waste hauler to the Department of Justice for prosecution despite findings by agency staff that the company was treating fields with so much human waste from septic tanks it risked poisoning nearby wells, DNR records show. Gunderson, a former Republican state representative, received $750 in campaign contributions from the owner of the company, Richard Herr, and Herr’s wife in 2006 and 2008. Last week, Gunderson said he forgot when he agreed to oversee the case that he accepted political contributions from the Herrs, major supporters of Republican campaigns as well as some Democratic candidates. Gunderson said even if he had been aware of the contributions, it would not have influenced his decision. The case normally would have been assigned to DNR deputy secretary Matt Moroney, who said he handed it to Gunderson because he was acquainted with another officer of Herr Environmental. The handling of the case, documented in an extensive enforcement file kept in the agency’s regional office in Milwaukee, raises questions about whether the political and business ties of top DNR administrators appointed by Gov. Scott Walker are influencing their handling of law enforcement cases, critics said. According to the staff memorandum requesting referral to the Justice Department, Herr Environmental’s records showed the company may have spread human waste on Jefferson County farm fields in 2009 at three times the levels allowed by its permit. The fields on which the company spread excessive waste are adjacent to about 30 residences in a rural Jefferson County subdivision as well as five neighboring farms. About 40 drinking water wells are nearby, according to DNR documents. Wastewater specialist David Bolha, the lead investigator, said he and other agency staff feared potential threats to public health, including possibly dangerous levels of nitrates in wells. Elevated nitrates levels can cause a potentially fatal blood disorder in infants called blue-baby syndrome. Also, according to the investigation files and citations, the company provided more than 60 inaccurate records after Bolha found inconsistencies in a 2010 inspection. Bolha reported he eventually was provided three sets of records by the company during his inquiry, each with different tallies of acreage and volumes of waste spread, each revised so the company appeared closer to compliance. In addition to the threat of steeper fines, Villoth said any settlement with the DOJ likely would have included a requirement that Herr pay for testing wells in the areas near the spreading. No such testing agreement accompanied the final DNR settlement of the case. But Gunderson said he hardly recalled reading Villoth’s referral and said the potential health implications of Herr’s actions were not discussed at length in the meetings he had with staff on the case. Instead, Gunderson and other DNR administrators sought to iron out the problem in meetings with Herr and Herr’s state representative, Joel Kleefisch, R-Oconomowoc, who interceded on his behalf, records show. At one meeting, on Dec. 13, Herr said he spoke with Stepp who assured him “no citations or forfeitures would be required,” according to Bolha’s notes. Herr also did not respond to telephone and email requests for comment. At a second meeting, on Dec. 20, Kleefisch — who also received $100 in campaign donations from Herr and whose wife Rebecca received $2,250 from the Herr family during her campaign for lieutenant governor — challenged Gunderson to reconsider the citations the DNR was weighing against Herr. “In the age of the DNR/Wisconsin Governor being pro-business, why is the DNR giving Herr 5 citations and why can’t 2 or 3 be taken away as a show of good faith?” Joel Kleefisch asked, according to Bolha’s notes of the meeting. He also reportedly asked that the fine be reduced. Kleefisch didn’t respond to a request for comment. Bolha also noted Kleefisch asked Gunderson to write the district attorneys involved suggesting the DNR would be in favor of even lower fines. In an interview last week, Gunderson said he recalled making the comments but said he did not ultimately write a letter to the district attorneys suggesting lower fines. Gunderson and Steve Sisbach, a law enforcement program manager who worked on the case, defended the decision to issue citations rather than seek DOJ prosecution because they said it could force the company into compliance faster rather than waiting for the Justice Department to act. The citations also are consistent with past enforcement of other septic companies for excessive spreading and inaccurate record-keeping, they said, although Sisbach said not all cases are necessarily the same. George Meyer was secretary of the DNR from 1993 to 2001 and also headed enforcement at the agency for almost 15 years. Now executive director of the Wisconsin Wildlife Federation, Meyer said the agency’s handling of the Herr case shows the danger of replacing natural resource professionals with political appointees with mostly business or political backgrounds. Meyer said he was particularly concerned about the allegations of inaccurate record-keeping. 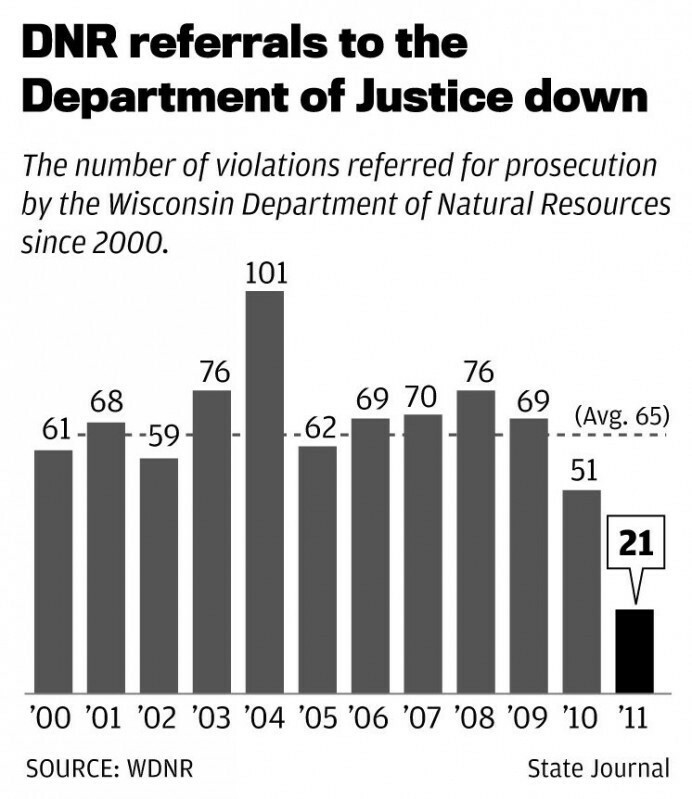 Enforcement by the DNR has dropped precipitously at the agency in the past two years with the issuance of violation notices reaching a 12-year low last year. Referrals to the Department of Justice also are down dramatically, from the 12-year annual average of 65 to 21 in 2011. Stepp and other administrators blame the drop on lack of staff as well as a change in philosophy that emphasizes cooperation with businesses and bringing violators into compliance earlier in a case rather than relying on prosecution. In a statement Friday, the governor’s office praised the DNR’s approach. “Increasing compliance and decreasing the number of environmental regulation violations is a good thing for Wisconsin’s valuable natural resources, Wisconsin residents, tourism, our economy and ultimately for the next generation,” Walker spokesman Cullen Werwie wrote. Stepp, in an earlier interview with the State Journal, said the agency would continue to go after serious violators. “Having been in a very competitive business in my life of home building, if there was anything that was very intolerable to me it was people, offenders, who tried to cheat customers and cheat the government and as such had an unfair competitive advantage against people like me who didn’t do that. “And so we have no tolerance for people who are trying to skirt the system or the rules and believe that willful, wanton violators should be prosecuted to the full extent of the law,” Stepp said. But enforcement staff within the agency said that wasn’t done in this case. “I think there was concern that there was more attention paid to this than was warranted,” Villoth said of the handling of the case by the agency’s top officials. Villoth recommended fining the company $20,000 to $50,000. Bolha, too, said he was surprised the recommendation to refer the case to DOJ was overturned in Madison. He disagreed that Herr required treatment similar to other septic rule violators and argued the seriousness of the violations, especially the extensive record-keeping violations, merited harsher penalties. Cathy Stepp should be replaced as secretary of the state Department of Natural Resources because of the agency’s poor environmental enforcement record under her leadership, Democratic gubernatorial candidate Kathleen Falk said Monday. Environmental enforcement activity by the state Department of Natural Resources has dropped dramatically in the past two years, according to data from the agency, with the number of permit violation notices hitting a 12-year low in 2011. A policy that would require officials with the state DNR to disclose previous campaign contributions if they are handling enforcement cases is being considered by the agency, DNR Secretary Cathy Stepp said. But she also defended the decision made in a waste violations case. Democratic legislators Wednesday called for the state Legislature's natural resource committees to investigate the actions of the state Department of Natural Resources in its handling of an enforcement case against an Oconomowoc waste hauler. Weak enforcement of waste hauler with political connections troubling. An Oconomowoc waste hauler fined by the state — but not prosecuted, as requested by Department of Natural Resources staff — made a "paperwork mistake" but didn't spread excess human waste on fields, an executive with the company said this week. Democratic members of the state Assembly's Natural Resources Committee have scheduled a public hearing Wednesday to look into how the state Department of Natural Resources handled an enforcement case against an Oconomowoc waste hauler. Legislators and environmental advocates Wednesday pushed for the state Department of Natural Resources to pay for well tests for as many as 40 residents who might have been affected by the excessive spreading of human wastes on fields in Jefferson County. Despite a plea from Jefferson County residents who live near fields where excessive amounts of human waste were spread, the state Department of Natural Resources has refused to order the waste hauler in the case to pay for tests of private wells in the area. The changes come in the wake of an enforcement case against a waste hauler that was handled by a politically-appointed official who had accepted campaign contributions from the penalized businessman.